Having five weekends in August helped South Mississippi's casinos earn $94 million in winnings for the month -- an increase of $4 million over last year and the best August since 2010. That puts the local market $7.5 million ahead of last year's pace and shows strength on the Coast despite the closing of Margaritaville Casino in Biloxi on Monday. Casinos in the river counties were down $8 million from a year ago to $90 million as competition continues to erode their revenue. 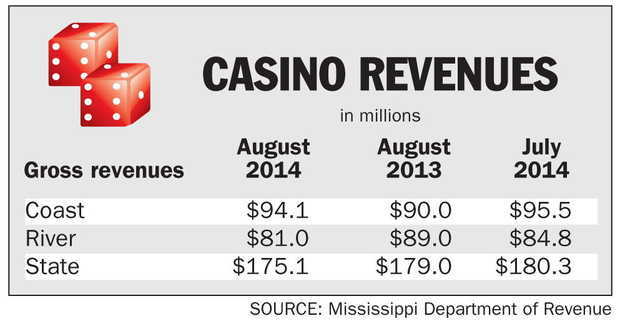 Mississippi casinos' gross revenue fell to $175.1 million, or 2 percent below August 2013, according to the report released Friday by the state Department of Revenue. Two casinos closed in Mississippi this year, but for different reasons, said Allen Godfrey, executive director of the Gaming Commission. Harrah's in Tunica closed because of the decline in the market from competition. Margaritaville didn't have a hotel to bring customers. South Mississippi now has 11 casinos, with several other casinos proposed. Scarlet Pearl is under construction and expected to open in December 2015 in D'Iberville.